As a huge fan of Kung Fu movies I was predisposed to like Kung Fu Steamed Little Buns Ramen just based on the name and before I ever read the strong review in the New York Times. Thankfully all of my pent up hopes for this place were not disappointed. 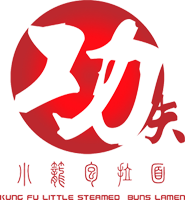 Kung Fu Ramen serves excellent Xiao Long Bao (soup dumplings) and Sheng Jian (Shanghai pan-fried pork buns), and is perhaps only surpassed by those at Shanghai Asian Cuisine. The chef, Peter Song, grew up in Fushun, in northeastern China, but learned the craft of making hand pulled noodles at the Lan Zhou Handmade Noodle stall in the Golden Mall in Flushing, Queens. Then, before opening Kung Fu Ramen, he returned to China for advanced study with a noodle master. You can see Chef Song pulling noodles in the open kitchen and hear the thump-thump of him smacking the noodles onto the counter as he pulls them out. Chef Song also had a career in TV and movies in China and one of the walls is adorned with photos from this part of his life, including, if I am not mistaken, a photo of him with the great Wu Ma, who was in A Chinese Ghost Story, Prodigal Son, Project A, Miracles and many other classic Hong Kong films. The Dumplings: There is a wide selection of dumplings available at Kung Fu Ramen which I have only begun to sample (there will be repeat reviews of this spot). For this outing I went with the Kung Fu Soup Dumplings, the Shanghai pan-fried pork dumplings and the vegetable dumplings. 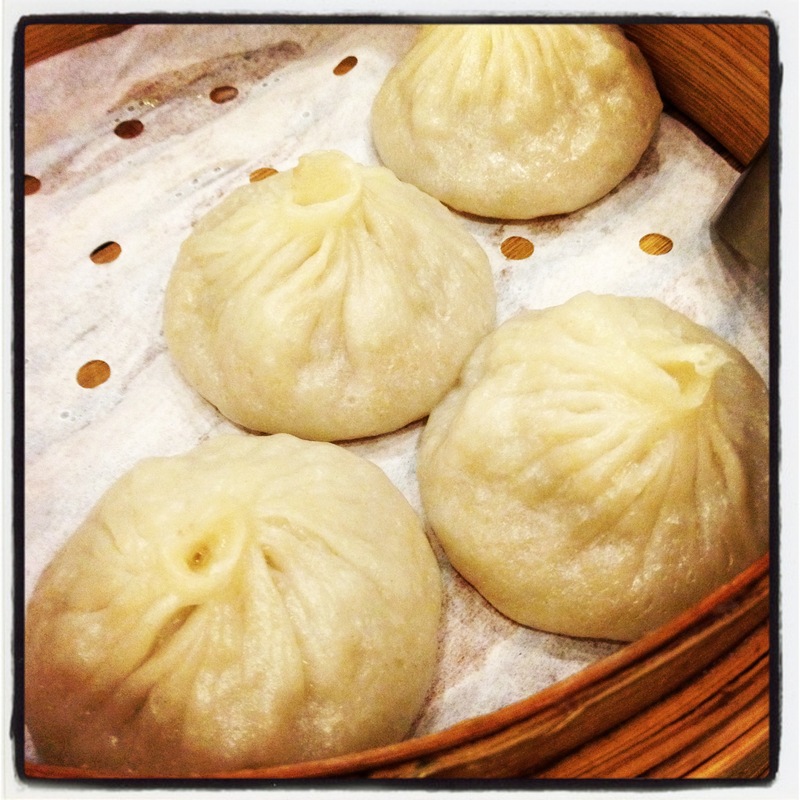 Kung Fu Soup Dumplings – I assumed these were the signature dumplings and they totally delivered. The wrappers were thin and supple but didn’t break open and spill the soup when I picked them up. Each one contained at least a soup spoon worth of unctuous pork broth and a tasty pork meat ball. A complete delight. Shanghai Pan-Fried Pork Buns – Very few places in New York do these well, but Kung Fu Ramen does them beautifully. My complaint with the typical New York version is that these buns are supposed to be full of soup and at most places in New York they are not or all the soup has been absorbed by the fluffy bun wrapper by the time the buns get to the table. The ones at Kung Fu Ramen were filled with soup, blazing hot soup, and like a rookie I managed to burn my lips on them. The pork filling was flavorful and well seasoned. My only mild complaint was that they could have used a sprinkle of sesame seeds on top of them. 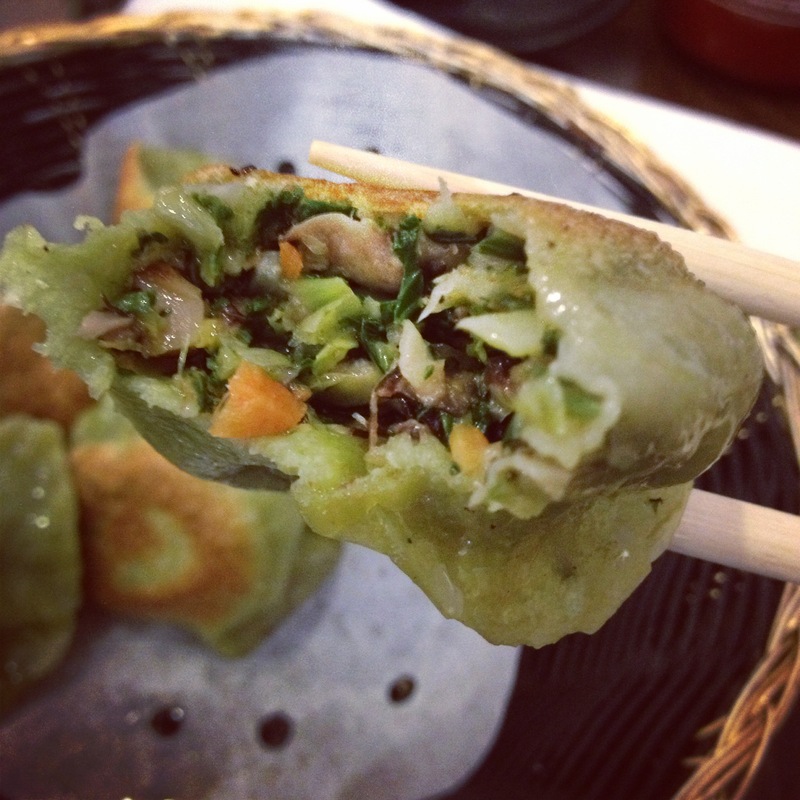 Vegetable Dumplings – These green dough wrapped dumplings come either pan-fried or steamed and are stuffed with minced bok choy, carrots and mushrooms. These were really delicious, there was a slight mustard flavor to the filling so I thought maybe there were mustard greens in the filling but the waiter said bok choy. These dumplings were fresh and light and very satisfying. The Dipping Sauce: There are bottles of mild black vinegar, soy sauce and Huy Fong Sriracha on each table, so it is strictly mix you own sauce. The Location: Kung Fu Steamed Little Buns Ramen is on the edge of Hell’s Kitchen on the West side of 8th avenue, between 48th and 49th street. 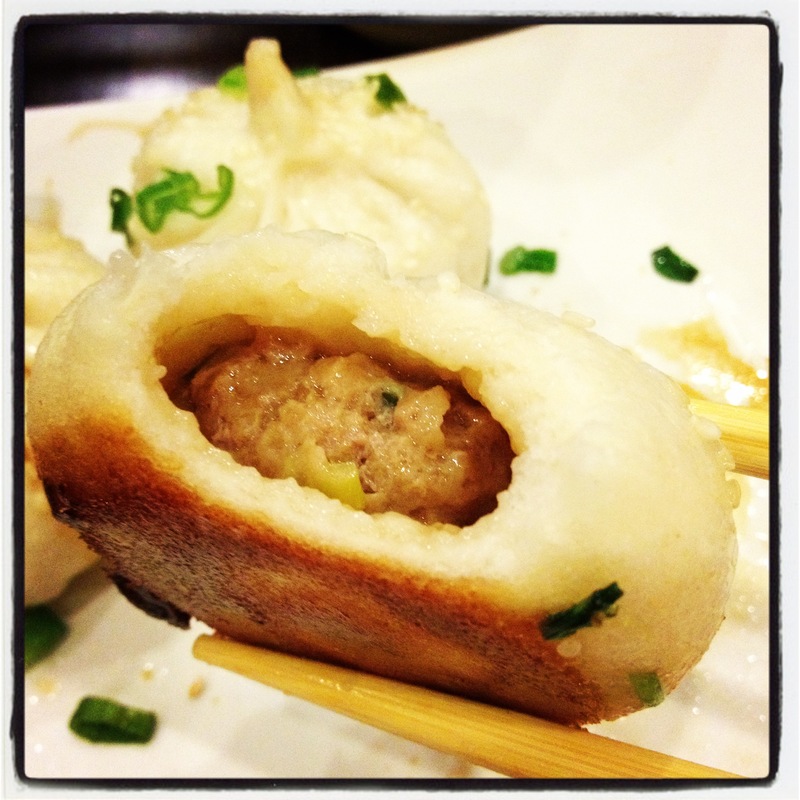 This entry was posted in Buns, New York City, Pan Fried, Soup Dumpling, Vegetarian. Bookmark the permalink.